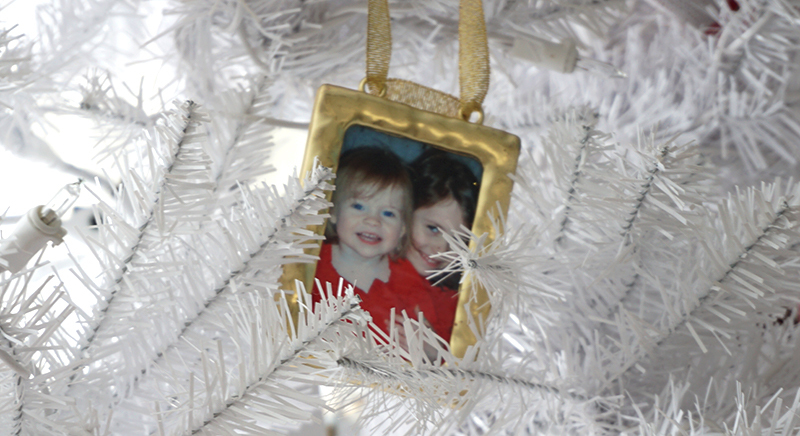 Christmas Decor for a Mindful Holiday | Your home, only better. 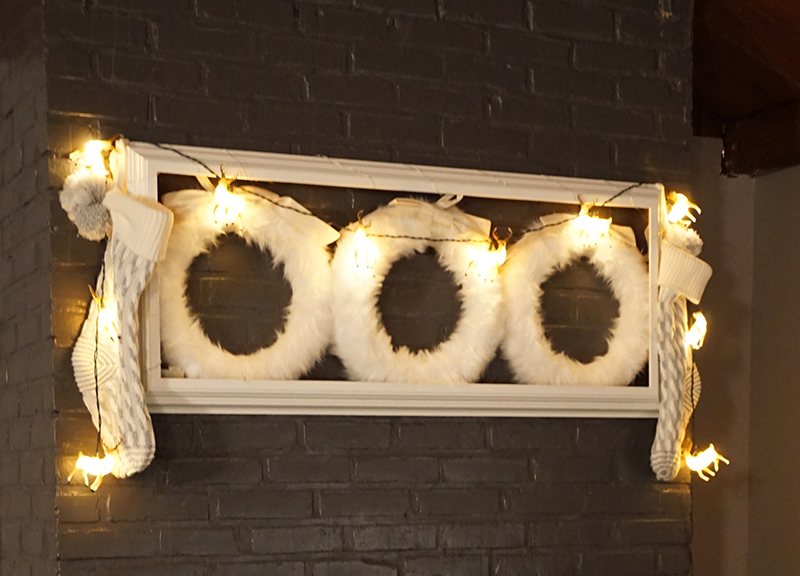 Initially, my intent for this post was to share Christmas décor ideas from my own home. But the more I thought about it, does it really matter? There are enough over-the-top ideas on Pinterest alone to make even the handiest of holiday-makers feel insecure and deplete bank accounts unnecessarily! Rather than letting Christmas explode throughout the room, I only decorated one corner of the living room to create a single focus. 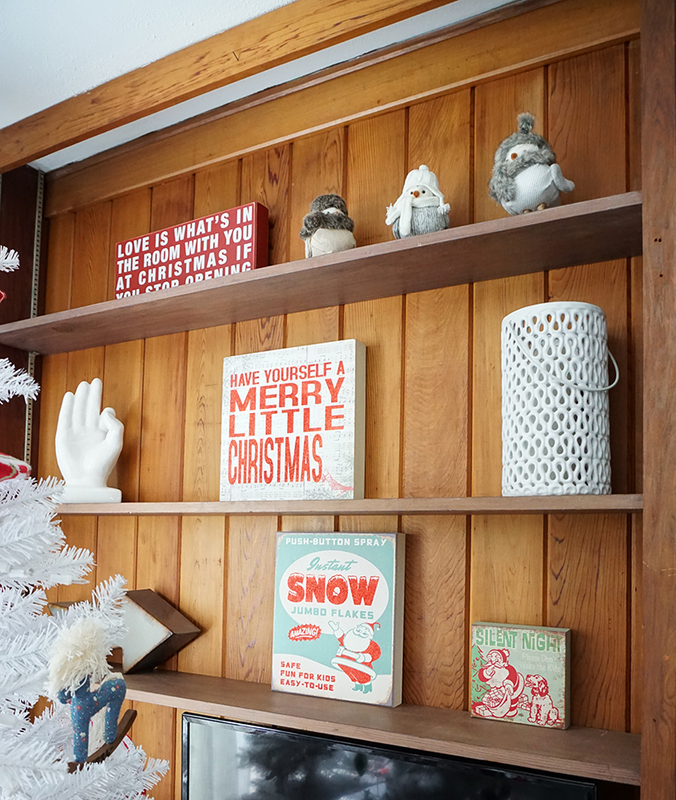 I displayed a few simple reminders on the bookcase, and other than a couple festive throws, that’s it! 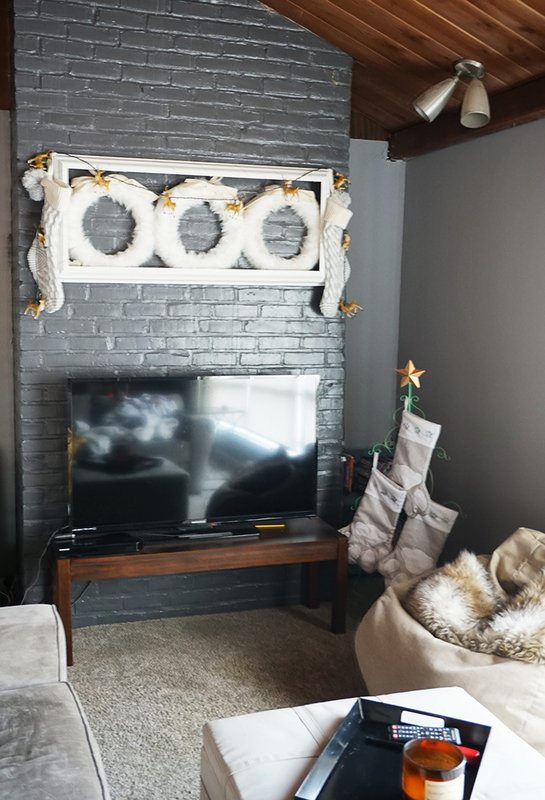 The fireplace in the living room does not have a mantel, and there just wasn’t room to add the stockings for the kids and dogs or my fluffy wreaths. So I moved the stockings to the rec room around the corner using a repurposed light frame and a wire Christmas tree to hang the stockings (with care). I love the glow from the reindeer string lights at night! My bedroom has always been a special place to unwind, mediate, drink coffee and just chill (ok, I mean nap). I switched up the linens, pillows and throws to create a magical place. Plus I hung a string of lights over my bed on a timer, so I now have to get to bed before they go off! Ok, now that we got that out of the way, let’s get real! Emotional expectations around the last 6 weeks of the year are unreal. No wonder it’s a time when depression, anxiety and suicide are at a peak. Stress is everywhere, such as keeping up with the neighbors, magnified family conflicts, kids stressed about exams, and the financial stress is ridiculous. Perhaps that’s why Thanksgiving comes first, to help us level-set our hearts before all else breaks loose. We make a list of everything we’re thankful for, but then often forget as the “holiday shopping season” takes over and turns us into stressed-out crazy people in a Walmart parking lot. There is no magical wand for reducing holiday stress, but here are four ideas that I have found helpful. Less is more (unless is money, then it’s definitely less). Use what you have before you dare step foot in Target! While it’s tempting to layer holiday cheer throughout the house, remember that clutter increase anxiety. And, it’s more to put away later! After your decorations are up, circle back to look through what you didn’t use. Donate those items to charity before the holidays to help brighten someone else’s holiday. Clean-up will be a breeze, and wouldn’t that be a great way to start the new year? Take a tip from the Hygge playbook – candles are effective, easy, affordable, and stress-reducing. Rethink sending Christmas cards. Confession – I stopped sending cards in 2012. We had just experienced tragedy in my town, and the “chore” of addressing, stamping and writing notes in all the holiday cards (which were already printed and staring at me from the kitchen counter) was more than I could bear. I quietly tossed them into the trash can and immediately felt a huge sense of relief. At a minimum, consider scaling back the list to those who would most need appreciate a card. Before you set up your vision for how Christmas should go, ask your family which traditions are meaningful to them. When I asked my daughter what her favorite Christmas memories were, she said having Danish pancakes for breakfast, and opening one present on Christmas eve. Simple, huh? Let the other stuff go. People remember experiences more than stuff. Gift cards for things you can do together will last longer than any trinket. Think outside the list. What would they not buy for themselves anyway? Is there something new to try? Ski lessons? Yoga classes? Pottery class? Whatever you do, don’t overspend because of the emotional expectations of the holiday. Gifting something homemade such as cookies can mean just as much. Personalize it with a poem or better yet, your time to make it more meaningful. Don’t forget to have fun. It’s easy to get lost in the sea of lists and chores. Take care of your physical self. Sure, enjoy those holiday temptations, but in moderation. Meanwhile, drink more water, get enough sleep, eat healthier, exercise. You know, all those things you promise yourself you’ll start doing. Do them! I’m a huge fan of the Headspace app. It makes it easy to learn how to mediate, and practice daily. It doesn’t have to take a lot of time. Just 10 minutes a day can do wonders! Give it a try! Remember that list you made on Thanksgiving? You know…what you are thankful for? Keep that in your heart (and maybe in a bold font on the refrigerator door) and you’ll be just fine! I wish you a merry and mindful holiday season this year! But first, what are you thankful for?